Health Aid Prostavital provides a specially balanced and formulated combination of a original combination of Saw Palmetto, Nettle, Pygeum & Pumpkin Seed Oil which has been enriched with Vitamins, Minerals & Amino Acids. 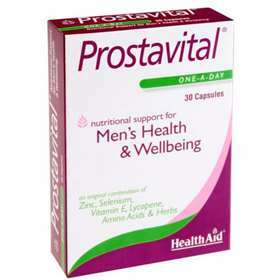 Prostavital offers optimal support to men's health and well-being; contributing to healthy fertility, reproduction, testosterone levels, and selenium which contributes to normal spermatogenesis. For optimum nutritional support og men's health and well-being. A combination of Extracts, Vitamins, Minerals & Amino Acids. Contributes to healthy fertility, reproduction, testosterone levels, and selenium. Free From Starch, Dairy, Lactose, Artificial Colours, GMO, Starch, Dairy, Preservatives & Flavourings. Suitable for adult and children over 16 years old. Take 1 capsule daily after food. Not suitable for children under the age of 16. As with all food supplements, this is not be used to substitute a balanced diet and healthy lifestyle. If you are on prescribed medication, consult professional advice before taking this supplement. This product contains soya and wheat. Capsule Shell agent (gelatine), humectant (glycerol, purified water), natural colours (titanium dioxide, sunset yellow, allura red, brilliant blue), Pumpkin Seed Oil (cold pressed), L-Glutamic Acid, Magnesium Oxide, Vitamin C (ascorbic acid), Bulking Agent (soybean oil, veg shortening, yellow beeswax), Lecithin (unbleached), Wheat Germ Oil (cold pressed), Vitamin E (dl-alpha tocopheryl acetate), Selenium Yeast, L-Alanine, Lycopene, Zinc Oxide, Saw Palmetto Standardised Extract, Vitamin B6 (pyridoxine HCl), Stinging Nettle Root Extract, Pygneum Africanum Bark Standardised Extract, Cupric Sulphate, Chromium Picolinate. *: EC Nutrient Reference Value Not Yet Established.